Learn how to use machine learning program Wekinator and openFrameworks to create a continuous color controller. 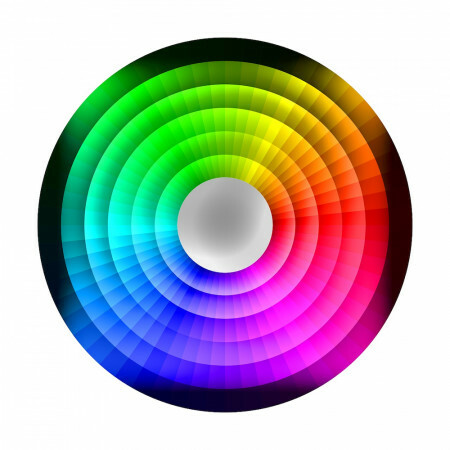 In this tutorial, we are going to create a continuous color control in processing using the input from openFrameworks while using Wekinator software to train the data. 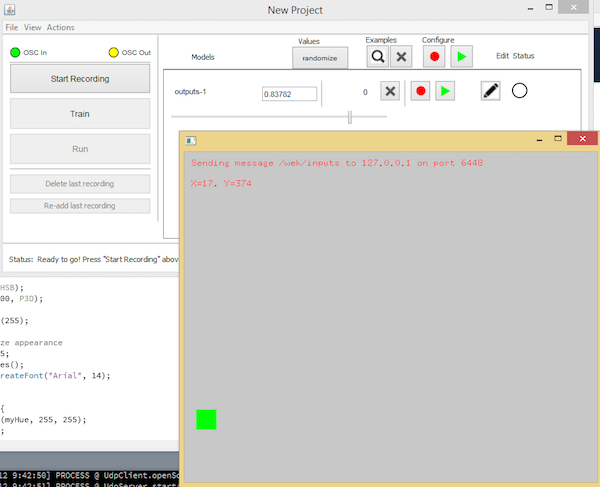 By creating a slider in openFrameworks, we can send the x and y values to Wekinator through the OSC communication. Wekinator will receive these values and will become trained accordingly. Wekinator will then send the output to the processing where the color of the output window will be changed. On the openFrameworks side, there are three files necessary for sending and receiving the data from Wekinator. Main.cpp runs the app and opens up the output window. This is the code necessary for the OSC communication between openFrameworks and Wekinator. In the update function, send the x and y values of the slider to Wekinator. In the draw function, make a slider that will move upon dragging it around. Create a new project using the project generator for openFrameworks. The Ofxosc addon is required for this project. 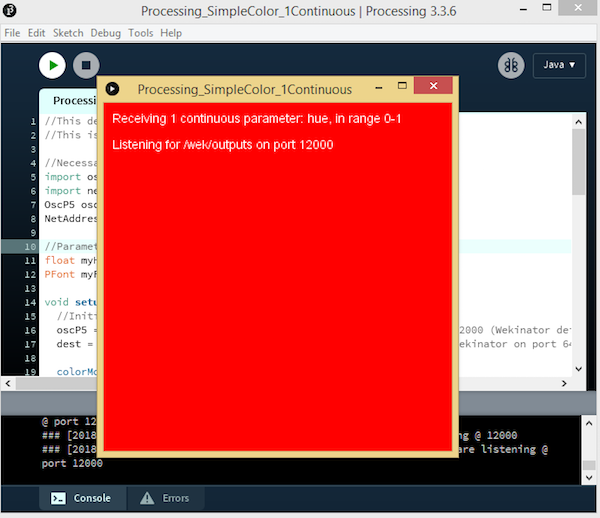 On the output side, we have a processing sketch to receive the output from Wekinator and will change the background color of the output window. The sketch will receive 1 continuous output from Wekinator. This sketch is available from Wekinator's examples page. Open Wekinator and make the settings as shown in the figure below. 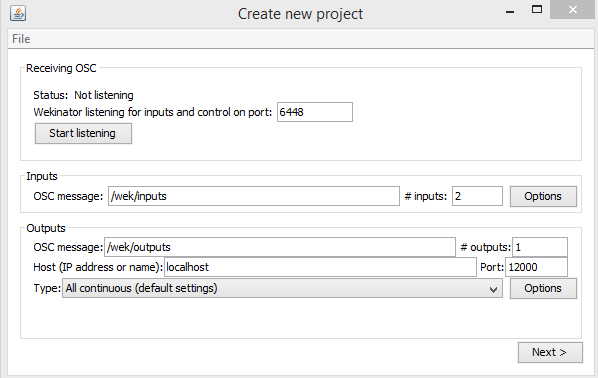 The create new project window in Wekinator. Set the inputs to 2 and the outputs to 1. Select the output type to “all continuous”. Wekinator will send 1 continuous output of any value from 0 to 1 to processing. Now click "Next" and it will take you to a window like the one shown below. The new project window in Wekinator. Now drag the green box in the processing window to any place and click "Randomize." Start the recording for a second and it will record some samples. Drag the green box to another place in the processing window and click on "Randomize" again. Start the recording for a second to record more samples. Drag the green box to any other place in the processing window and click on randomize for the third time. Start the recording for a second to record more samples. Now click on "Train" and then click "Run." Dragging the slider in the openFrameworks window will change the background color of the processing window. Check out the video below to see how the finished product works!